CAPE CANAVERAL, Florida - The Astronaut Wives Club, a mini-series on ABC about the wives of the Mercury and Apollo astronauts will premiere at 8 p.m. EDT on Thursday, June 18. While many of the scenes in the mini-series revolve around events that actually occurred on Florida's Space Coast, viewers won't see any Florida on-location shoots of those scenes. That's because The Astronaut Wives Club was shot almost entirely in Louisiana due to taxpayer-funded entertainment credits from the Bayou State. Scenes that are set in Cocoa Beach, Florida were actually shot in Slidell, Louisiana. 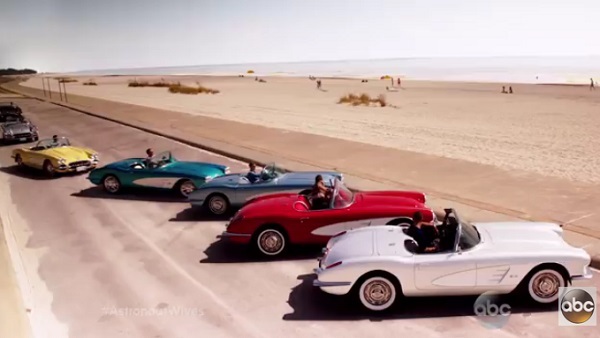 In one scene, the astronauts are driving corvettes they received from a publicity campaign by the Jim Rathman car dealership and pull up to a beach that has a similar background geography to the beaches along Cape Canaveral and Cocoa Beach. But this isn't the first time that Cocoa Beach has been portrayed off location in a high-profile production. Except for the wedding episode, I Dream of Jeannie wasn't shot in Cocoa Beach even though nearly every episode supposedly took place on Florida's Space Coast. "Although the show was not filmed in Cocoa Beach (as with I Dream of Jeannie), just having Cocoa Beach mentioned in the mini-series should provide some good exposure for us," said Cocoa Beach Mayor Dave Netterstrom. "At least there shouldn't be any mountains in the background like you saw on Jeannie." Netterstrom was disappointed, however, that the filming didn't take place in Cocoa Beach. "I don't see any negative affects for us [being portrayed in a different city] but it certainly is a shame they didn't film in Cocoa Beach. If they did film here, just think about all the community involvement they would have got. I'm sure us "insiders" have a lot of stories that could have been included that nobody has ever heard." "I know the main issue was that the state of Florida is not handing out any tax incentives to film in the state while Louisiana and other states do offer the incentives," Netterstrom said. "Not sure it was specific to this show exactly, but I did reach out to the Governor and other elected officials for help. They were considering some money for this go around in the legislature but of course that has all been put on hold." "I do know multiple attempts were made to try to make it work," said John Lux, Chief Operations Officer for IDEAS, a media and experience design company in Orlando, who writes about Florida's entertainment industry and is a supporter of Florida's film credit program. "However, when trying to compete with Louisiana, or any of the other 35+ states that offer some sort of program to attract film, TV and digital media companies and projects to their region, just having good weather and a lot of nice beaches doesn’t cut it. Not being able to attract this single project means a loss of ~$20 million per season in spending on the Space Coast as well as potentially some lost revenues for my company since we typically get a piece of projects like that when they are so close." The State of Florida had a entertainment production incentive program that was funded with $296 million in 2010, but that program ran out of money in 2013 which left no funds available for the production of Astronaut Wives Club in 2014. One major tourism success of Florida's film credit program was the movie Dolphin Tale, which told the story of a dolphin, named 'Winter', at the Clearwater Marine Aquarium that was fitted with an artificial tail. The interest generated by the movie to visit Winter has quadrupled attendance at the aquarium and will generate over two billion more tourism dollars to the area, according to a study by the University of South Florida’s St. Petersburg College of Business. Dolphin Tale is viewed as a tax incentive double success - not only because of the immediate economic impact while filming, but that there is also a publicity legacy which drives tourism to the film location long after the movie hits theaters. But under the program, Florida's entertainment credits were awarded on a first-come, first-serve basis with little evaluation as to what economic impact, if any, the project might produce in the Sunshine State. While that policy had successes like Dolphin Tale, it also led the taxpayer funding of Spring Breakers which drew controversy over its repeated scenes of drug use and violence that portrayed the Sunshine State in a bad light. Despite the controversy over the content of Spring Breakers, Lux puts the movie in the tax credit "success" column. "The definition of “success” needs to be clarified here. There are mainly two forms of success when it comes to film, TV and digital media projects," said Lux. "The first form of success is whether or not money was spent in Florida enhancing our state economy and whether Florida residents were hired in high-paying jobs for extended periods of time. The second form success is the ancillary things that come out of a project including enhanced tourism." "In terms of a film like Spring Breakers, it was a success in the first definition, the project came here, hired Floridians and spent a lot of money that wouldn’t have otherwise been spent in that region. First and foremost the tax credit program is a jobs program. The content of the film may not have been the ideal image for Florida. But going all the way back to Miami Vice and Scarface in the 1980’s, Burn Notice and currently Graceland, fictional stories oftentimes do have some questionable content," said Lux. "New Mexico has seen an increase in tourism since the show Breaking Bad premiered a number of years ago. Nobody would say the content of Breaking Bad is family-friendly but it has spurned an increase in tourism with people wanting to see where the show was filmed. Similarly, Georgia has seen an increase in tourism, actually doing organized tours of locations seen in The Walking Dead, again, not a family-friendly TV show. So while it is important to look at content when it comes to tourism impacts, that doesn’t always mean the film or TV show needs to be warm and fuzzy. Not saying Breaking Bad and The Walking Dead are the norm, but it’s something to think about when people immediately what to disassociate themselves with darker content. From an industry perspective, that’s why we focus more on the high-wage jobs created and the economic impact to the local area as well as the state because you never really know what happens after something hits the screen, whether it’s film, TV or digital media."